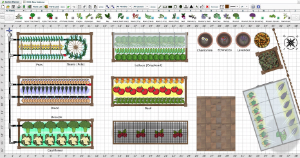 Jeremy Dore was banking on the idea that everyone can use a little help when it comes to planning next year’s garden when he came up with the idea for the Garden Planner app. The idea for the app was sparked when he and his family started growing more of their own food in 2005. “With young children, we wanted to get into growing more healthy organic food ourselves, but quickly realized that there was a huge amount of information that gardeners were meant to hold in their heads to get the planning right,” says Dore, noting that plant spacing, crop families and rotations, and when to plant for your local climate are all complex subjects. The Garden Planner helps gardeners understand the complexity of their gardens before they wield a shovel. The app includes design tools that “understand” plants and help gardeners make easy choices, via clearly depicted visual presentation. And although the app was designed for the United Kingdom market — Dore’s garden was the app’s testing ground — once the app was launched in 2007, his team discovered the app could be adapted for use in other countries. Dore says he founded the company to help people grow food with success. While Dore is an amateur gardener, he hired horticulture experts to develop the app.. The horticultural consultant for the United States is Barbara Pleasant, a respected gardening authors with books published over 30 years on edible gardening. Pleasant is also a contributing editor to Mother Earth News. Writers and horticultural experts were consulted for each major region covered, including the U.S., Canada, Europe, South Africa, Australia and New Zealand. Dore also employs data analysts who examine climate data from weather station records that aren’t publicly available. Dore self-financed the company and app, and so far, the company is independent and debt-free. “Profits have grown organically and we reinvest profit into developing the tools further and extending it to mobile platforms,” he says. While the app does work for most regions of the world, Dore wants to expand his company’s databases. The app currently operates via a web browser on PCs and Macs, but a native app for the iPad and iPhone should be available soon, according to Dore. The fee covers access to the tool, planting reminders, priority customer support, backup of plans, and continued development of the software and tools. He adds that row covers, greenhouses, and hoop houses can be added to the app, and the system will automatically calculate earlier planting dates and extended harvests for the crops underneath. Dore says a variety of people, including new gardeners and experienced gardeners, continue to download the app. “Some who have been growing for over 30 years use the system to track crop rotations, and record how each variety performed,” he says. The app also caters to schools and professional gardeners, and offers educational and master accounts. When asked if he has any advice for app startups and urban farmers, Dore says that app startups need to believe in their apps, trust that their apps are vital and stick to building a cohesive team of committed employees. “Being able to sustain this over several years is what sets apart the best tools from the mediocre ones,” he says.